Once the British withdrew their mandate from Israel in May 1948, ad hoc postal offices were created in Nahariya and Safed. The government issued overprints on the Jewish National Fund stamps to start off with. On May 16th, 1948, the Israel Post issued the first set of Israeli postal stamps, the Doar Ivri series, under the provincial government. This series translated over to the “Hebrew Post” and was named so because the region of Israel did not have an official state name at this point. This series, designed by Otte Wallish, included designs from ancient coins from the First Jewish-Roman War and the Bar Kokhba revolt. 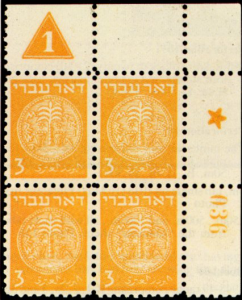 Israeli postage stamps have been printed in Arabic, English and Hebrew throughout the years but more recently have been printed in Hebrew and English. 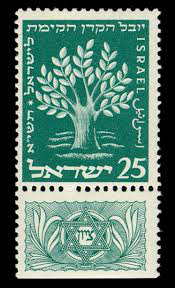 By 1960, over 325 different postage stamps designs were released in Israel, some depicting nondenominational stamps with a olive tree design. By the 1990’s, Israel tried using vending machines for postal labels and 22 designs were issued depicting tourist sites and holiday designs. Israeli postal stamps have often depicted religious imagery such as the holy sites, Jerusalem and Jewish holidays, some of which also fall into the category of tourist visitor locations. Special annual stamps series are released each year to commemorate Rosh Hashanah in a festival series. Israeli postage stamps, as well as Saudi Arabian stamps, have also honoured different world leaders. Israel was the first country to honor Chiune Sugihara in 1998 and since has issued stamps in memory of Moroccan King Hassan II and Jordanian King Hussein in 2000.